The show, Harmony and Good Harvest, gives glimpses of how the pig has been depicted in Chinese culture through 60 exhibits that illustrate the economic and social aspects of people's association with the animal over time. The pig symbolizes propitiousness and good harvests, and reflects people's yearning for better lives, the show's curator Zheng Hao says. The pig is among the earliest domesticated animals in ancient China and was seen as a symbol of agriculture. The Chinese character jia (home) consists of a common component, baogaitou, which is the upper part of the character that implies a house, and the component shi, the lower part, which refers to pigs. As the composition shows, a settled life with a stable food supply was a major source of happiness for the ancient Chinese. People's opinions of the pig have changed over time. There was a time when people offered pigs as sacrifices to gods and ancestors. Images of pigs often appeared in books or were carved on utensils and used as decorations. However, there was also a time when pigs were perceived as less diligent than cattle and slower than war horses. They were viewed as "impure and dumb". The positive view remains mainstream, though. Zhu Bajie, the pig monk from the classic Chinese novel, Journey to the West, has provided an ambivalent image of laziness, gluttony, lust and cowardice mixed with lightheartedness, endurance, loyalty and humor. The figure is indispensable in portraying the pig in Chinese culture, and the exhibition is no exception. Other exhibits include pig figurines made of pottery, porcelain and jade, and royal artifacts with pig motifs. 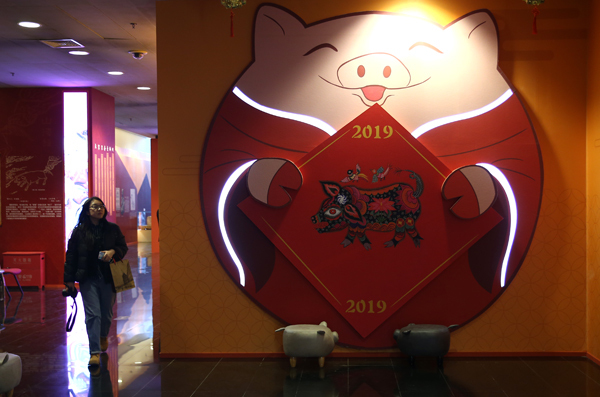 A new exhibition celebrating the Year of the Pig opened to the public at the Capital Museum in Beijing on Tuesday. The first day of Lunar New Year falls on Feb. 5 this year.